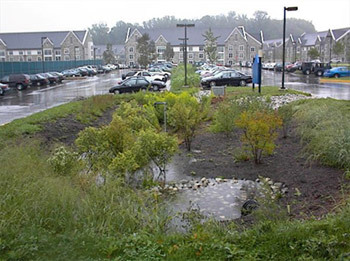 Infiltration basins are shallow features where stormwater runoff is stored until it gradually infiltrates through the soil of the basin floor. An overflow may be required for extreme rainfall events which exceed the capacity of the basin. The performance of the basin depends largely on the permeability of the soil and the depth to the watertable. Infiltration basins can serve larger catchment areas than infiltration trenches because a larger volume of water can be stored on the surface. They can typically serve catchments of up to 10 hectares. As with the infiltration trench, the life span of the infiltration basin may be increased by providing runoff pre-treatment, such as a filter strip, gully or sump pit to remove excessive solids. Larger basins need to be designed carefully to prevent sediment being washed out during storms. Regular maintenance will be required for most pre-treatment designs. Properly constructed and maintained infiltration basins can be expected to remove a large proportion of solids and a lower proportion of soluble pollutants. View sites in Wales with a Infiltration basin system.